One of the questions I wanted to answer with my Garduino was how much light is lost through the plastic covering of the Greenhouse. What I have found is it is very difficult to find a light sensor that has the dynamic range from darkness to full sun, but I finally stumbled on the MAX44009, which has a range from 0.045 to 180,000 Lux. The downside of this device is no one is making a breakout board for it, so I was on my own. Yes, this beautiful homemade PCB does work. I made it by the laser toner transfer method, but my home printer, a Brother HL-4040CN did not work; the toner did not stick to the copper board no matter how long I put the iron on it. I ended up creating a PDF file with Gerber2PDF and printing the image on some HP printers at work. Unfortunately, in my rush to not be caught screwing around with something that wasn’t work related, I forgot to make a mirror image of the PCB, so everything is backwards on the PCB. Even with the HP toner, the toner transfer was not very good, but, considering the fact that the MAX44009 chip is 2mm x 2mm and the pads for the 6 pins are 0.36mm x 0.48 mm, the toner transfer was accurate enough to work. Adding to the fact that this was the first time I used my hot air re-work station to do something constructive, you could have knocked me off my chair with a feather when the final assembly actually returned valid data. I was expecting to have to handled the situation where I would have to programatically change the sensitivity of the device so that I would have to set longer integration times in low light conditions, and shorter ones in bright conditions, but the device handles that all by itself. The device can be configured in a manual mode so that the user has control of exactly what integration time will be used for each reading, but in my case, the automatic setting behaved the way I wished. I’ve created an Eagle library that contains the land pattern for the MAX44009. I really like the I2C bus, but its major disadvantage is the max length which is reportedly pretty short. I currently have the MAX44009 sitting off of about 2.5 M of 6 conductor satin cable, connected to the same 3.3V bi-directional voltage translator circuit my BMP085 is connected to, and it is working well. I expect when I have to connect another MAX44009 to measure the light loss from inside the Greenhouse, though, the length will become a problem. I will be researching some I2C bus lengthing techniques and will report on them in the future. The waterproof enclosure for the MAX44009 consists of a plastic food container with a clear plastic cover, and the bottom cut out for ventilation. 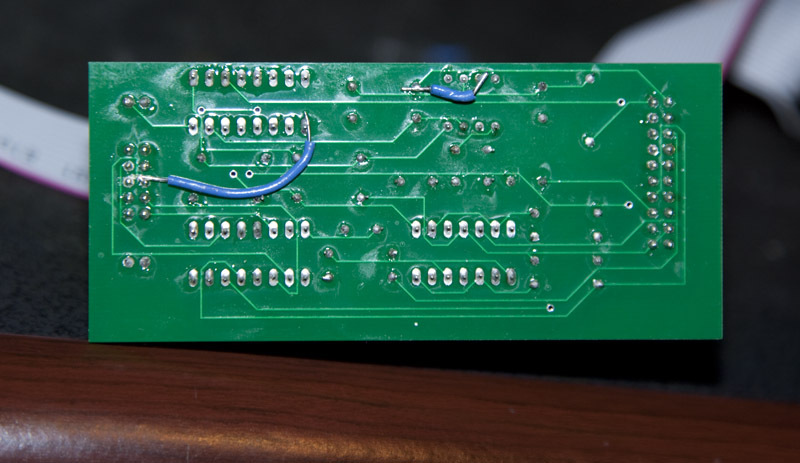 This is the PDF for the Break Out Board that I used for the Toner Transfer method to create the PCB. 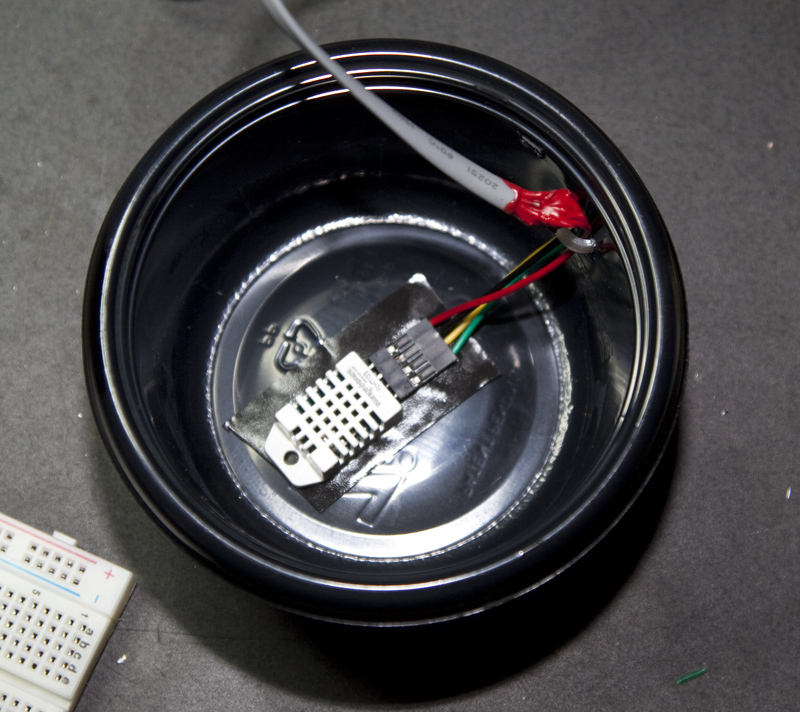 The BMP085 is a I2C Barometric Pressure/Temperature sensor available from both Sparkfun and eBay. The Sparkfun breakout board is very expensive, about $20, but they have excellent instructions on how to use it. You can get the BMP085 chip on eBay for about $4 and the breakout board for about $6 for 3, but you have to be able to solder SMD to use them. Before I put in the compensation for altitude, my pressure was always too low. Once I compensated for my 142 M altitude, the results from this device are spot on. I’m very happy with the accuracy of this chip. 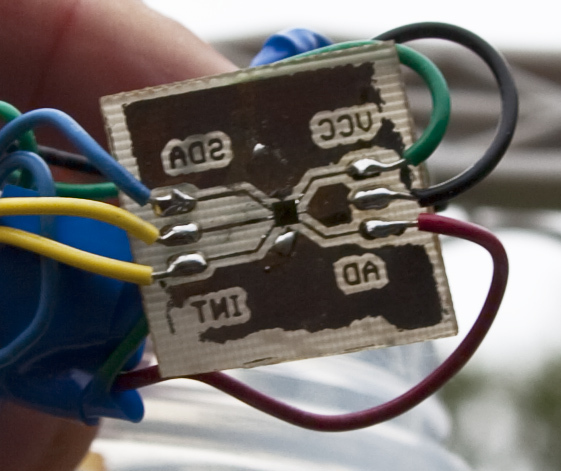 Bi-Directional voltage translator for the I2C bus. 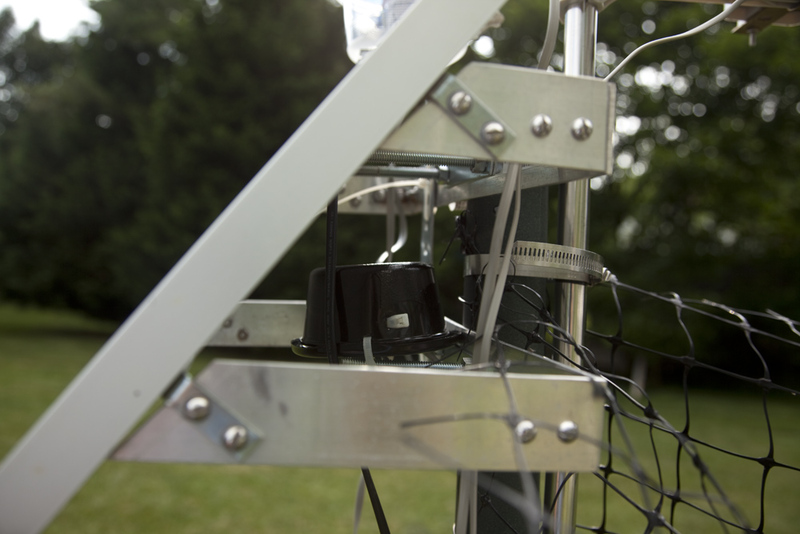 Over the last year my Garduino project has morphed into more of simply a weather station. While I still have plans to activate a water valve with the Arduino, my failure in creating a reliable moisture sensor has led me to more or less indirectly guess the soil moisture my measuring the temperature, rain, and humidity. To measure the temperature and humidity, I’m using the RHT03 (referred to as an RHT22 and DHT-22 as well), available from Sparkfun, and on eBay. Signal handling is done in the readRHT03 function. After sending the start sending signal, the Arduino uses Timer/Counter 1 to time the incoming pulses. Originally, I was trying to use micros() to measure the timing, but I got some very erratic results. This gave me the opportunity to use my new Saleae Logic Analyzer. As you can see in the code, I have Pin 6 follow the state of the data input from the RHT03. Normally, there is a 15us delay between the time the RHT03 changes state and the time Pin 6 changes state (the time to execute the if statement and the digitalWrite()), but sometimes it is longer. The highlighted pulse on Channel 1, though, shows the delay is at least 10us longer. To make a long story short, this is caused by interrupts in the Arduino, and turning off the interrupts before I start timing the pulses fixes that problem. Functions like millis() and micros() need interrupts to be update, though, so I could not use them with the interrupts disabled. This means I had to use the hardware timer/counter to time the pulse length, which is what the references to the TCCR1A, TCCR1B and TCNT1 do. Additionally, to measure the time the interrupts are disabled, I set Pin 5 (Channel 2) to go high when the interrupts are disabled and low when they are re-enabled, which gave me about 4ms of “interrupt-less” time. Since my weather station is going to be polled at 60 second intervals, I now know that the timers won’t be running for about 4ms of that time, so I have to set my timers to 59996 to get a 60 second poll. Anyone using this code should pull out all the references to Pin 5 and 6, unless they want to use them for debugging as well. Note the short pulse caused by the Arduino handling other interrupts. The other thing to note is the temperature is pretty inaccurate when the device is in direct sunlight. My original design had the RHT03 sharing the waterproof container of my MAX44009 light sensor, but even though it is open to the air at the bottom on the container, the temperature inside the container got well above 110°F on bright sunny 90°F+ days. 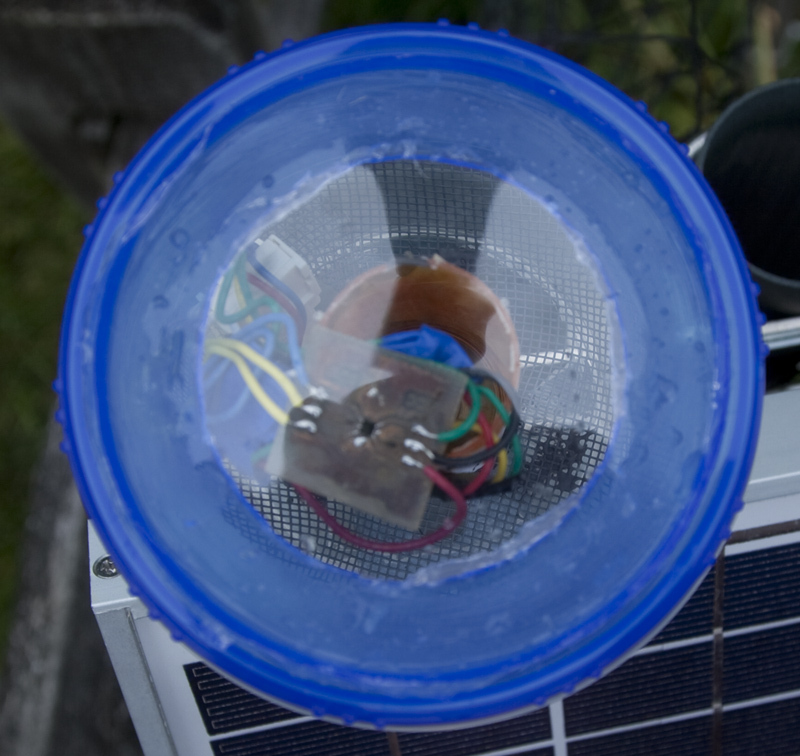 I’m now extending the cable to the RHT03 and putting it in it’s own container, shaded by the solar cell. I will update on how well that works. Mount for the RHT03 to keep it out of the rain and the sun. The RHT03 is in the container on the left with the blue top. 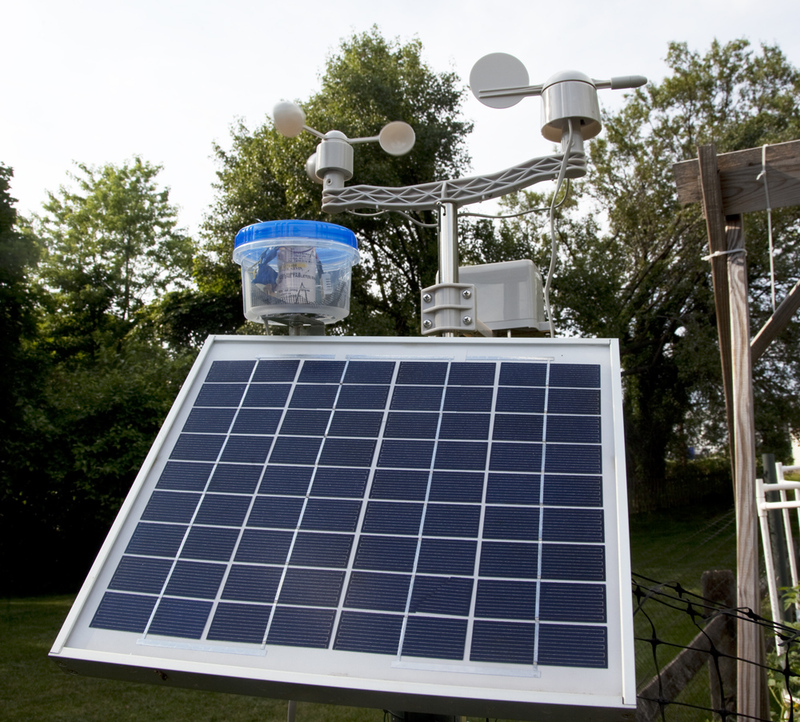 This container also houses the MAX44009 sun sensor. New location of the RHT03, under the black cover. In order to allow me to use the XBee radios to remotely download the logged data to my PC, I’m going to have to use an Arduino Mega 2560. The Uno just doesn’t have the interrupts to use with the frequency counter, as well as a software serial port for the XBee, so the extra UARTs on the Mega are required. 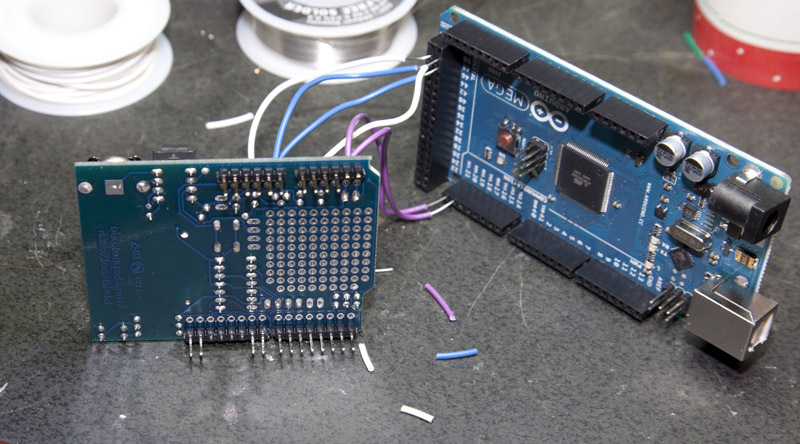 While the Logger Shield from ladyada.net physically fits into the Mega, the SPI and I2C pins are different between the Uno and the Mega. The libraries the run unmodified. I will incorporate this into a new PCB at some point. TCCRXB |=  (1<<CSX0) ;// External clock source on T1 pin. Clock on rising edge. // External clock source on T1 pin. Clock on rising edge. I’ve broken the sketch for the Garduino into 4 separate files. The main module, called Garduino, is the flow control of the sketch, and contains the setup and loop methods. The DataGather file contains the methods related to reading the sensors, and the OutputFormat source focuses on creating the output of the sensor data to the SD card. The SDFunctions pde file contains the functions to read and write to the SD card. This project uses both the SD card in the logger shield, and the FreqCounter library, so the .h files are included at the top. Most of the setup() is pretty straightforward; it is concerned with initializing the SD card and Real Time Clock (also part of the log shield). The DO_FILE define allows me to test the code on Arduinos without the SD Logger Shield, and turns off all the SD card related code on demand. The loop() simply waits for the wait function to return false, and then calls the data gathering commands and prints out the data. The wait function is the only place where there is any trickiness to the code. The variable testTimeDiff keeps track of the number of milliseconds from start of the previous test by calling the diff_time function. The diff_time function normally just subtracts the time from the previous time the function was called, but it also compensates for the rollover of the millis counter, which occurs every 9 hours or so. There is also the PAUSE_ADJUST define which is subtracted from the TEST_PAUSE. TEST_PAUSE is set to 60000 milliseconds, or 1 minute, so the polling of the sensors occurs every minute. When the frequencies are read for the moisture and light sensor, though, the clock is stopped, so I need to subtract the amount of time spent in the frequency counters to accurately pause for 1 minute between each sensor poll. The readAnalog function sets the address pins for the analog multiplexer (4051) and then reads the value of the analog pin (A0). The various combinations of the 3 address pins select the 4 temperature sensors. The readFrequency also uses the address pins to select the digital input on the digital multiplexer (74151) to put the pulse train on pin 5. It then takes 5 measurements, each 250 ms long, and stores them in an array. The array is passed to the processValues function, where the low and high value is thrown out, and the remaining 3 values are averaged. During the 250 ms the frequency test is running, the millis() is not accumulating. Since there are 5 tests for each frequency sensor, and there are 5 frequency sensors tested, a total of 6250 ms is “lost” to the millis() because the timer is turned off, and that value must be removed from the TIME_PAUSE to keep the test running at exactly 1 minute intervals. These functions output the values from the sensors to the Serial port and the SD card. Note the float data, which comes from the frequency counter, is multiplied by 4. This is because the frequency tests are 1/4 of a second long, and I want the output value to be in Hertz. These functions are simply stolen from the SDFat examples, and initialize the SD card and the log file. 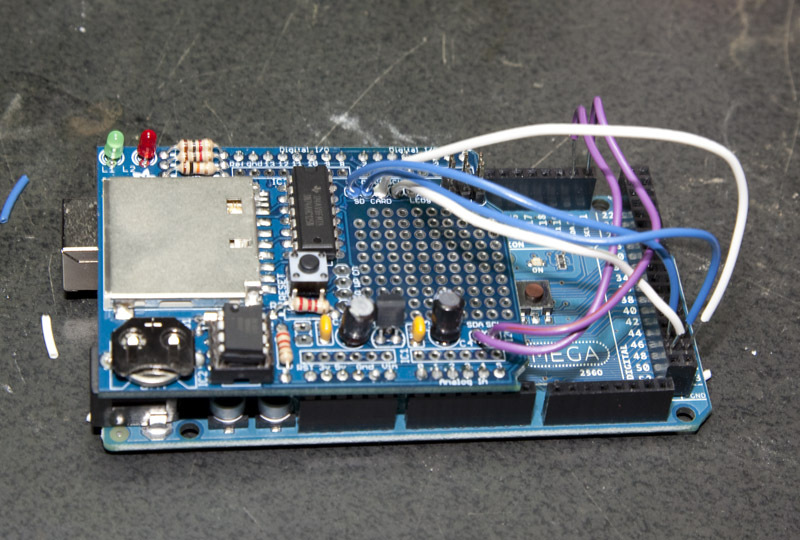 This Garduino takes input from various sensors and logs it to an SD card on a Logger Shield. The moisture sensors and light sensors both generate a frequency of pulses as their output, and there is only 1 timer input on the Arduino Uno that can measure this (pin 5), so I use a 74LS151 Multiplexer to put these signals on pin 5 and use Pins 7 (D0),8 (D1), and 9 (D2) to addresses the various inputs. The LM335 temperature sensor is an analog device which I can simply plug into the analog pins of the arduino and do an analogRead, but the SD shield uses A4 and A5, which leaves me with 4 free analog inputs. Although I am only supporting 4 temperature sensors now, I decided to use an 4051 analog multiplexer to put all the temperature signals onto A0, leaving A1-A3 free for future purposes. Pins 7-9 are also used to set the address on the 4051 as well. Because the electrolysis that occurs on the probes of the moisture sensors when sending a direct current through the damp soil, the moisture readings will change over time, so it is best to test the soil resistance (the de facto measure of soil moisture) with an alternating signal. The 556 and 555 supply this alternating signal to the 3 moisture probes. 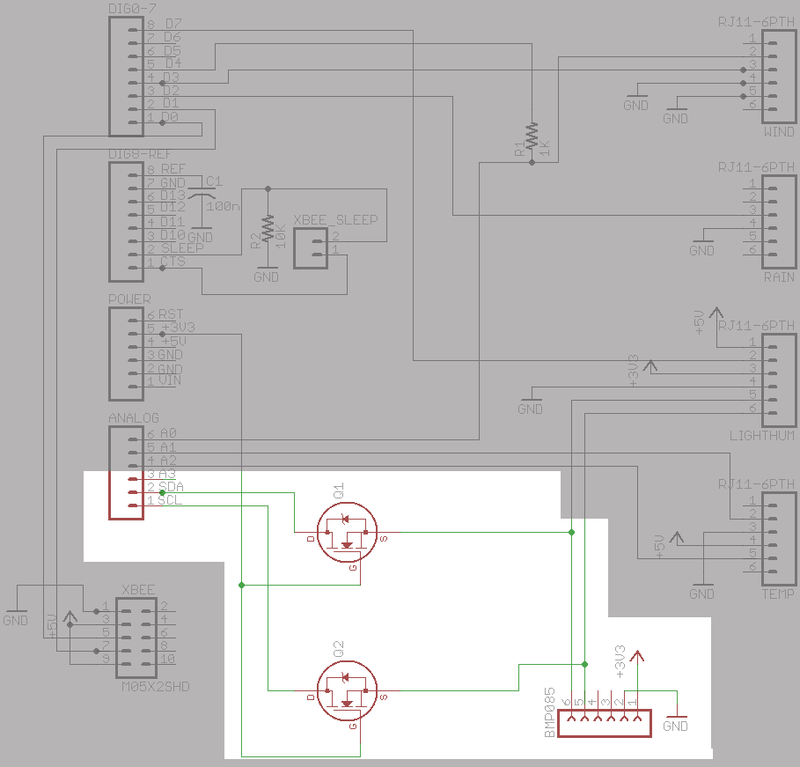 This is the schematic of the complete circuit board. The left hand ribbon cable connector leads to another ribbon cable connector soldered onto Logger Shield. Pins 1 & 2 connect to the Arduino +5V and GND, pin 3 connects to the timer pin 5 on the Arduino, pins 4, 5 and 6 connect to Arduino pins 7, 8, and 9 for the multiplexer addressing, and pin 7 on the connector leads to the A0 pin on the Arduino pin to read the analog values of the temperature sensors. 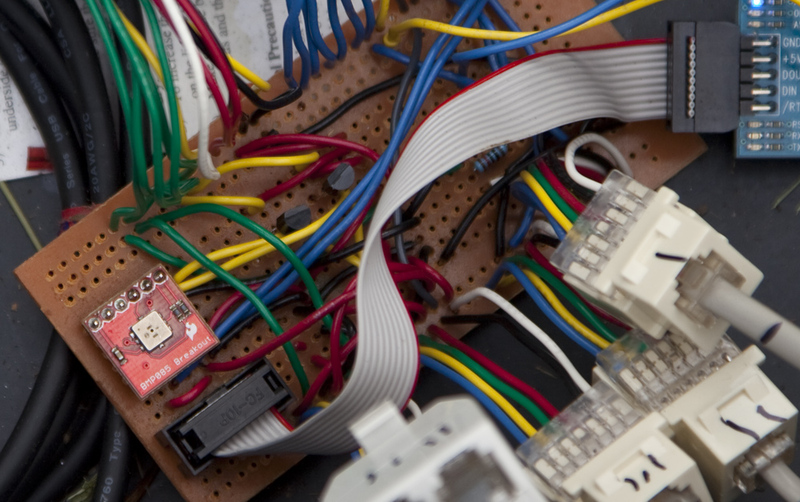 The 20 pin ribbon cable on the right is to interface to the sensors, which will be discussed in a later blog entries. 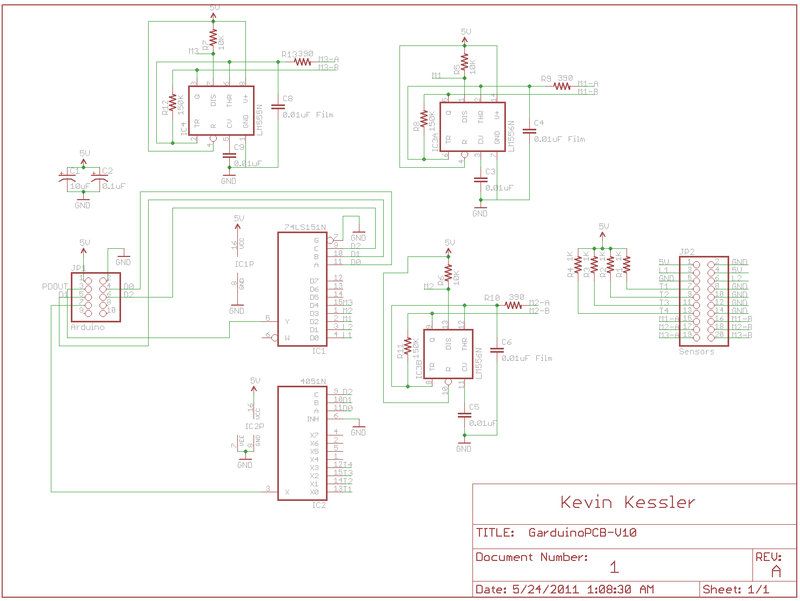 I decided to use the EAGLE software to build my first PCB, which was produced by BatchPCB. It took about 3 weeks to get the board after ordering it, which was apparently fairly fast, but BatchPCB trades time for cost, and the total cost of the board was about $30; far less than you would pay for other services. This is a picture of the completed board attached to the Arduino Logger Shield. Somehow 2 connections which where on the Schematic did not make it on the Layout and onto the PCB, but luckily, it was fixable. I still have a lot to learn about EAGLE.